For a better understanding, the CGPEB also updated the CG Pre Polytechnic Test Notification 2019 in both Hindi and English Languages. So, by checking them the Students may know what the courses are offered and List of colleges, etc in Chhattisgarh clearly also with the counseling process and Exam Format. Technical Education & Employment Board, Chhattisgarh Likewise, Every Year, For the Academic Year 2019-20 also, the Chhattisgarh Diploma Entrance Test Notification 2019 on 02.03.2019 for making the Students who completed their SSC/ 10th Class and ITI study their Higher Education of Diploma Courses in Reputed Colleges of Chhattisgarh State. So, for that, students have to Apply For CG PPT Notification 2019 in Online. But, before that, they are suggested to have an overview of the Details published on the CG Pre Polytechnic Test 2019 Notification for knowing the Counseling Dates, Procedure, Exam Format, etc and other for making themselves clear while applying. Bookmark JobsChat.in for knowing the CG PPT Exam Dates Info. Students who are eager towards Registering For Chhattisgarh Vyapam Diploma Engineering Notification 2019 have great news. CGPEB activated the CG Vyapam PPT Online Application Form on 26.03.2019 and receiving the Applications from the eligible students who want to make Diploma in best colleges. CG Vyapam will provide the best colleges for the Students who qualify in this CG PPT Exam. So, Students who Check CG Vyapam PPT Advertisement and Completed the Registration have to Download CG PPT Syllabus and then do preparation for the Exam by covering all the topics. Because based on the Student Score, Seat Allotment in the best colleges will be provided. Students who Completed their 10th Class or ITI in any Field from reputed Institute of Chhattisgarh State Must Enrol for the CG PPT Notification 2019 For Diploma Courses. 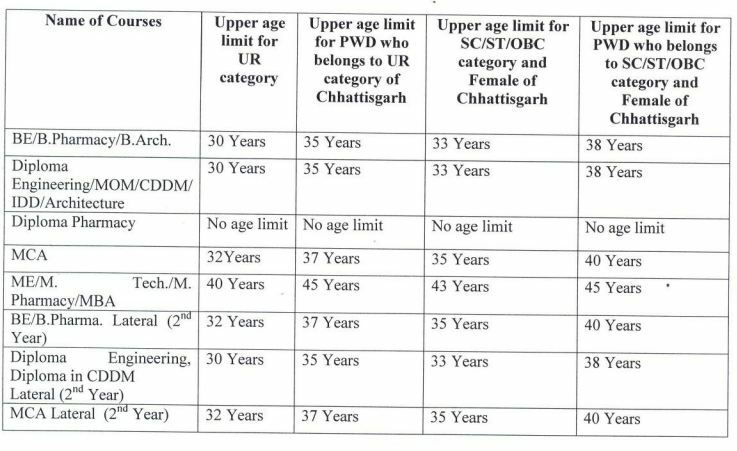 As per the Chhattisgarh PPT Notification 2019, Category wise Age Limits are as follows and the Cut off For Age Limit is 01st July. Chhattisgarh Professional Examination Board will conduct the Following rounds for making entry into Diploma Courses. Chhattisgarh Professional Examination Board offered the CG PPT Notification 2019 with CG PPT Online Form 2019 @ cgvyapam.choice.gov.in of which the document must be checked by the aspirant and then follow the Instructions while filling the form and Bank Payment fee etc and then do fill the Form and Submit it on or before the last date 14.04.2019. After this, CGPEB Board does not accept the Form at any cost. Furthermore, The Applications will be verified by the CGPEB Board and will accept only if all the details are correct. Otherwise, Submitted CG Vyapam PPT Online Application Form will not be accepted. That to the Student must Keep a Copy of Chhattisgarh Vyapam PPT Application Form along with original certificates of the Education which are to be submitted in the Counselling process. Firstly, Students who want to register for the CG PPT Notification 2019 definitely check the Advertisement once and get a clear cut overview on all the details and then Complete the Form. Then As per the Schedule, CG Vyapam PPT Admit Card will be issued and Exam Will be conducted on 09.05.2019 of which the Students who appeared for the exam can choose their Choice Of Course in Diploma in respective college by attending the Counselling. Chhattisgarh PEB will consider the candidate’s marks and Category, locality, and others and will make provide the seat in any of the college by considering all the Guidelines which are mentioned on the cgvyapam.choice.gov.in Diploma Engineering Notification 2019.